Get an advanced copy of LRN's State of Moral Leadership in Business 2019 Research Report. In this month's edition of Ethics & Compliance Monthly, we are unveiling our first research report of the year, the 2019 State of Moral Leadership in Business Report. This report is launching on the heels of the 2019 World Economic Forum in Davos, where trust, purpose and moral action were the major topics of discussion. We've found that the demand for moral leadership is growing stronger, as major ethics and compliance failures continue to appear in headlines. In addition, we present you with our latest perspectives and top headlines, new product and course releases, and upcoming events. Continue reading below to learn more. 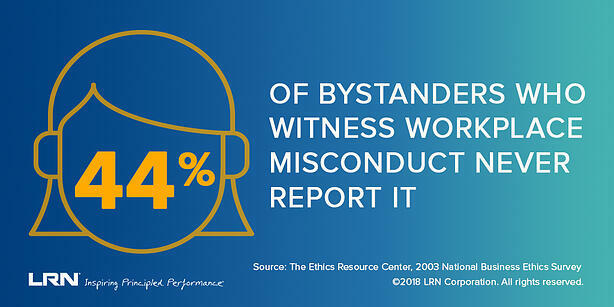 LRN's annual Moral Leadership Report will launch next week. Before it's released to the public, we wanted to provide our Partners with advance access to the report. This year, we share results from interviews with more than 1,100 employees, managers, and executives across 17 different industries. The research confirms that the case for moral leadership is growing stronger, with 87% of respondents saying that the need for moral leadership in business is now greater than ever. We have released a short video clip from our latest Catalyzing Conversations Toolkit: The Tone from the Very Top - Board Oversight of Ethics and Compliance. This toolkit is designed to give boards an opportunity to explore their role in ensuring corporate integrity and ethical conduct through the critical lens of the legal and policy obligations they have in overseeing corporate behavior. Marsha Ershaghi Hames was recently published in the SCCE’s recent publication, The 2019 Complete Compliance and Ethics Manual where she dives into the role of the compliance & ethics practitioner around the topic of anti-harassment. Her article unpacks the various elements of workplace harassment, the impact on culture and breakdown in trust. LRN report findings and key insights from LRN colleagues were recently featured in the media. David Shadovitz, Editor of HR Executive, wrote a piece on employee advocacy at Google and featured quotes from David Greenberg and insights from our Board and E&C report. 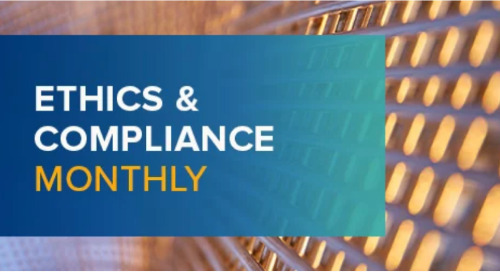 Susan Divers, David Greenberg and the Board report were also quoted in a recent Forbes article on effective compliance going beyond fancy programs. By popular demand, we're proud to share our report that details best practices for operationalizing and embedding ethics and compliance into your organization within a moral framework. Download the PDF or view the presentation online to learn six actionable steps that need to be taken on the journey to becoming a values-based organization. In our first #HOWMatters conversation of the year, LRN CEO Dov Seidman was joined by Zainab Salbi, humanitarian, media host, author, and founder and former CEO of Washington-based Women for Women International. Watch the replay to gain insights about the rise of women in positions of formal authority, the impact and future of #metoo, and the role of freedom in creating more diverse and inclusive workforces. Dov Seidman attended Davos last month and spoke on several panels about the importance of having a culture of trust and a purpose-inspired mission. 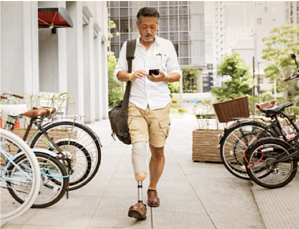 Watch his panel with Accenture on innovating with purpose or check out LRN’s Twitter Moment recapping the event. 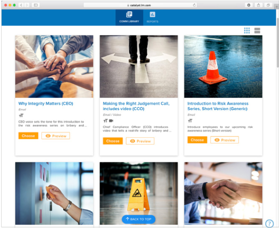 Communication Manager is a new platform tool that allows Partner compliance and communication teams to deliver targeted, high-quality messaging to their diverse global businesses on key E&C topical risk areas. -Access real-time analytics, and more! Don't forget to say hi to LRN if you'll be attending any of the events below! Unfortunately, most instances of workplace harassment go unreported. 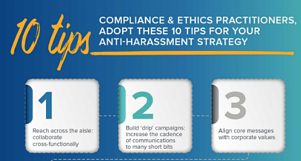 LRN's full suite of training courses help organizations prevent harassment and promote speak-up culture. For suggestions, feedback or product support, please contact us at info@lrn.com. In this month's edition, we're pleased to invite you to join our new community of ethics and compliance leaders to elevate your expertise and brand. Be one of the first to download LRN's 2019 Ethics and Compliance Program Effectiveness Report. In addition, learn more about our latest product and course updates and register for our new webcast. January's edition highlights LRN's newest courses and resources on the crucial topics of anti-harassment and tone at the very top. It also includes a sneak peek of our new tool, Communication Manager.